A bean removed from the soybean pod, which has been soaked in a water-based solution, dry roasted, and salted or seasoned. 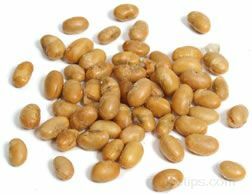 Depending on the selected purpose, the bean is flavored accordingly, perhaps with a sweetened glaze, to become a snack food or a bean used to complement salads and other types of food dishes. Unsweetened forms of the nut are often used to complement food dishes, by providing a crunchy texture and a unique, nutty flavor.